This past December, the Strategy and Portfolio Planning Community of the NYC Chapter of CoreNet hosted the 2018 Project of the Year finalists from UM, White & Case, Nixon Peabody and Take-Two Interactive in an insightful discussion on corporate strategy, portfolio planning, finance, sustainability, and the attraction and retention of talent. The discussion titled “Who Wins CoreNet NYC Chapter Awards and Why?”, showcased the finalists which were selected based on their improvements to core business functionality or work environment, the innovative use of technology, demonstration of innovative design, engineering or technology practices and cost reduction or improved productivity in the workplace. Below is a summary of some of our key findings. Director of Real Estate, Brian Foreman of Universal McCann (UM), a division of The Interpublic Group of Companies (IPG), presented their recent expansion and improvement of their global headquarters to a full 95,000-square-foot floor plate in IPG’s 300,000-square-foot vertical campus overlooking Greely Square at 100 West 33rd Street. Constrained by a tight budget and a deep floor plate with few windows, Jeff Knoll and Mitchell Ross from architects Ted Moudis Associates (TMA) described how they retained as much of the existing layout as possible while creating vibrant neighborhoods and amenities linked by pedestrian flows that increase collaboration. The move from standard offices to a free address workplace, and the carefully considered branding - which features products of clients like Chrysler Motors, Coca Cola and US Postal in the space – has increased staff creativity and driven new business. 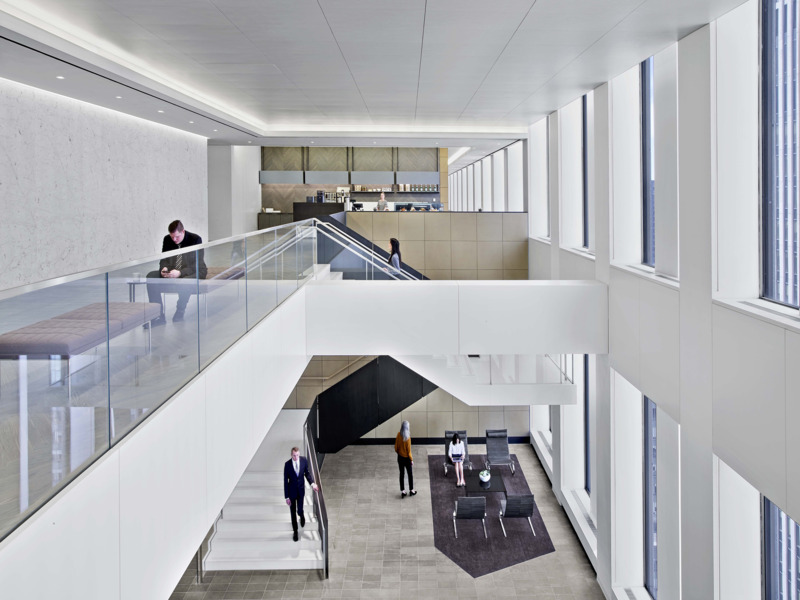 This year, White & Case relocated their global headquarters to 1221 Avenue of the Americas. With this relocation, White & Case moved away from their traditional aesthetic into a modern law office environment with a focus on collaboration and level of transparency. Tom Polucci of HOK Architects provided a deeper analysis reflecting their design through a new workplace strategy on this 440,000 square foot office that Structure Tone provided the construction services on. . By conducting multiple focus group discussions, inclusive of first year associates and completing many hours of observations in their workplace, Tom and the team discovered particular ways of working within the law firm. Specifically, HOK recognized that mentorship was an important activity at the firm. As a result, HOK incorporated glass walls and community spaces that would encourage employee interaction, visibility and communication. Additionally, HOK strayed away from the traditional law firm layout, in which private offices are placed along the perimeter of each floor, and instead replaced those areas with team-oriented zones. These elements have allowed White & Case to continue to work without any physical obstacles. Regional Administrator, Dorothy Montgomery from Nixon Peabody and Principal, John Sadlon and Jeanette Kim of Perkins+Will discussed features of the law firm’s newly relocated NYC office at Tower 46, also known as Gem Tower. The new office space was recently selected as one of five organizations named for Crain’s New York’s “2018 Coolest Offices in New York City” award. The workplace features floor-to-ceiling windows, a strategically located staircase to promote employee wellbeing, and a dynamic reception/event space with a pivoting digital media wall for flexibility to accommodate a variety of business and social outreach functions. Nixon Peabody’s 26-person committee worked with Perkins+Will to incorporate all these factors into their program. Additionally, the project has earned LEED Gold Certification for being environmentally sustainable and resource efficient. The new offices support the client’s key business objectives as a result of the design team’s integration of vision strategy, branded experience, employee wellness, hospitality, and flexibility to adapt. After analyzing metrics, it was found that the new space had transformed the firm’s day-to-day business activity. Specifically, employees began to utilize their café area for not only internal meetings, but for select client discussions as well. Further, it was noted that since moving in, managers have taken to no longer reserving conference rooms for interviewing potential hires. Rather, interviews are conducted during a casual “walk around” in order to expose recruits to the firm’s dynamic culture and innovative workplace. The new environment has allowed the firm to strategize differently by giving their clients an immersive experience, rather than just a discussion or meeting. Overall, the creative and flexible design solutions at Nixon + Peabody has provided an environment for the firm to expand their spark and invite options to lead a change in business operations. Larry Charlip, Senior Director, Facilities and Real Estate Management from Take-Two Interactive (T2), the video game holding company of Rockstar Games and 2K responsible for Grand Theft Auto and NBA 2K, described the move from their prior space in trendy Soho to a ”big boy” space in corporate midtown overlooking Bryant Park. Gabe Hernandez and Jessica Mazur from Design Republic architects explained how they modified a double height Japanese restaurant and Internal Revenue Services (IRS) entrance lobby off 44th Street into a huge hi-tech conference room and private entrance lobby complete with 14-foot video wall. Staff and guests upon taking the old IRS escalators up to the second floor arrive at a pantry and town hall where T2 launches new games, before moving into workspace across two floors with fluid stand boards at each desk and video game artwork on the wall. The new space, which retains some of the industrial chic of their old space in Soho, has won over employees – and one senior manager, who wasskeptical of the move to midtown. In addition, it also won the Avenue of Americas Association Technology Innovation Award. The event provided CoreNet NYC members with detailed information and advice from professionals who are designing the most innovative spaces in Manhattan. Presenters carefully guided attendees through the intricate design and construction process of these modern offices. Members left the conversation with a deeper understanding of employee needs, creative problem solving and effective collaboration. Nominations for the 2019 Projects of the Year are now open. The Chapter has been working hard on enhancing the awards process, and publication thereafter. In light of the strong economy and continued pace of the NYC CRE market, the 2019 nominees promise to raise the bar in workplace design and strategy. For more information on how to submit for the Chapter awards, please click here.